Some drive. Some fly. 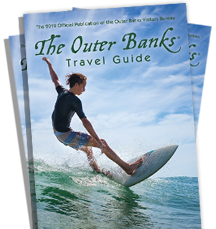 Either way, how to get to the Outer Banks and navigating the islands once you're here are both easy. Try as you might, it's virtually impossible to get lost here – the ocean makes a pretty good landmark. As for flights, the Outer Banks is easily accessible from Norfolk International Airport (82 miles north) or Raleigh Durham International Airport (192 miles west), with the drive in being quite scenic, although filled with anticipation. Please be advised of an upcoming I-64 Widening Project on the Peninsula in Virginia. There are no planned daytime lane closures; however, nighttime lane closures are in effect Sunday through Thursday beginning as early as 8 p.m. until 5 a.m. the following morning. As you may know, this corridor of I-64 can become quite congested during the summer months, and visitors may want to use our free traffic information tools (VA511 website/phone/app or tune to 1680AM) for real-time updates. We also recommend using Route 460 when possible to avoid congestion. Avoid Summer Saturday Traffic With These Helpful Tips.